I just came back from a week in Paris attending a meeting of field experiments’ scholars, and I took the opportunity to do some fieldwork. There are perfectly good reasons why I study French water governance, specifically in Paris, but that discussion is reserved for another post. When I do fieldwork or when I am at conferences, I am often constrained by how intense the workshops are, and therefore I sometimes don’t have the time to write 2 hours per day, as I have on my schedule. I need to be more flexible and take care of my own physique. 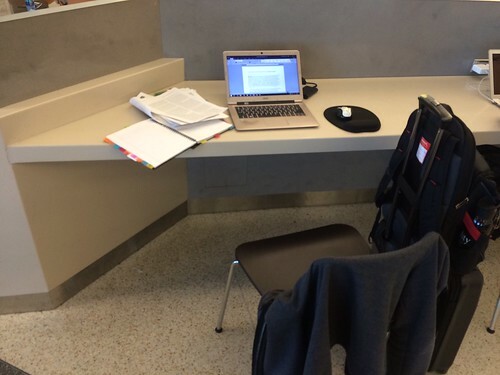 So I write when I can, often times, on planes or trains or buses during my commutes. 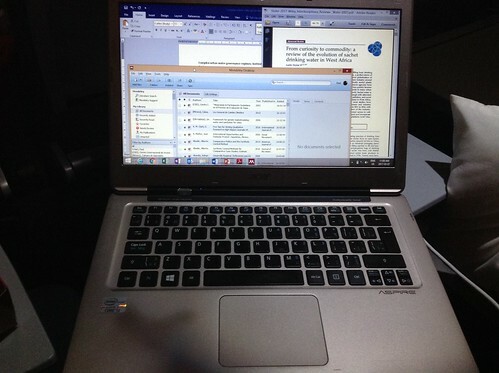 Those who asked: I just wrote 668 words on the flight from Mexico City to Aguascalientes. It's a 40 minutes' flight. But I was concentrated. But when I travel for conferences, workshops and fieldwork (obviously becoming quite exhausted) what I also face sometimes is the dreaded blank page. Sometimes I don’t know how to start writing something, despite the fact that when I am editing I always have my Drafts Review Matrix in front of me. So, what I do to motivate me to write is that I use prompts. 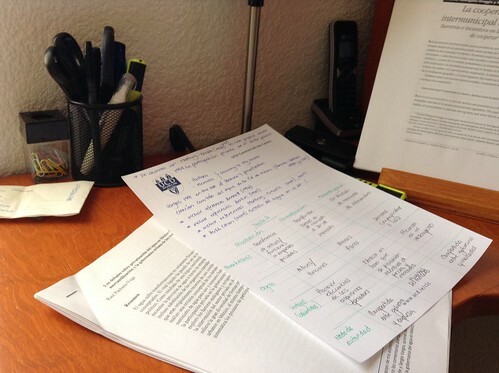 And coincidentally, as I was researching my own Twitter account, came across this excellent blog post by Nicole Cesare on turning your notes into prompts. When I see these prompts, these physical cues, these calls to action, I feel prompted to start writing. It’s like I have an opportunity to capture some thoughts and I shouldn’t let it slide. In examining my own workflow, I have identified four different types of prompts. If I feel like I can’t write anything, because I am facing writers’ block (it does happen to me from time to time) I open a PDF of an article or a book chapter. I feel even more compelled to write notes when I am writing on my Everything Notebook or when I have the PDF open on Mendeley. Having Mendeley open alongside Word usually prompts me to write a memorandum. Having Mendeley and Word open simultaneously basically forces me to write some words, because if I don’t, I would feel like this travel time would be wasted (I only write on a plane when I’ve actually already had a good, solid nap – my health comes first). Datasets are one of the easiest sources for written material, and act as fantastic prompts to inspire me to write, because I need to, at the very least, describe how I assemble the dataset, what it contains, what it means for my research, for the paper I am writing, data sources, etc. Even just describing the dataset will prompt me to write. Also, as Dr. Adam Wellstead mentioned in response to my tweet, datasets can allow you to use them and reuse them for multiple papers, using different theoretical and empirical strategies. I always keep 3 programs open: Mendeley, Word and Evernote. This helps me spur some thoughts and start writing them. Also, STATA/Atlas.ti. If I have Excel open and/or STATA and I can see the full dataset or analysis, I feel prompted to write up results/ideas for analysis. Results are also some of the best prompts to write when you have writers’ block, at least for me, because I know that I already have something that I have analyzed and I need to make sense of them. That’s why having STATA or Atlas.Ti open in front of me helps me feel compelled to start writing those results, to understand why they came out the way they did. Also, assembling tables of results by hand, as I show above, is one of the ways in which I feel the most energized and compelled to write. Moreover, tables really help me clarify my mind. Because I do a lot of things the analog way, I often need to transcribe notes from the margins of my articles or my Everything Notebook on to a Word file (often combining the literature into a nice, in-depth memorandum). Having handwritten notes acts as one of the strongest prompts for me to write. 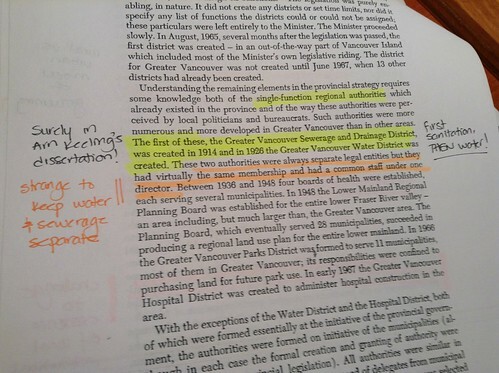 For example, in the case above, my own scribbles on the margins of the paper act as prompts, because I am leaving a note to myself saying that I should check Dr. Arn Keeling (a dear friend of mine who is an urban historical and environmental geographer and who studied the governance of wastewater in Vancouver in the late 1800s and early 1900s)’s PhD dissertation. This is EXACTLY the strategy Nicole Cesare mentions in her excellent blog post here. These are, as I have mentioned with all my other blog posts, hacks I use to motivate myself. I get distracted, like any other human being, but I use these techniques to bring me back on track. Hopefully they’ll be useful to you if you are facing writers’ block!